Since we opened our doors in 2016, we’d frequently have questions popping up around gluten-free and gluten reduced beers. 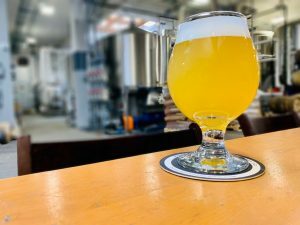 We’ve been working on creating that for our customers and are excited to announce our newest collaboration beer with Stillwater Artisanal Beer, Test Sour, which is a gluten reduced Sour Ale. In order to keep this beer full of body and flavor, we employed an enzyme that specifically breaks down proline rich gluten forming proteins without impacting the beer finish itself. From this, we sent a sample to an independent testing lab to confirm the exact levels of gluten. The lab analysis registered the beer’s gluten levels at the limit of detection which is < 10 parts per million. With that, we are able to identify the beer as gluten reduced per the FDA. And now, we’re pleased to introduce Test Sour, which we think is a pretty tasty beer in and of itself whether you are looking for gluten reduced beer or just enjoy a nice sour ale. We invite you down to our Tap Room to sample it for yourself. Cheers!